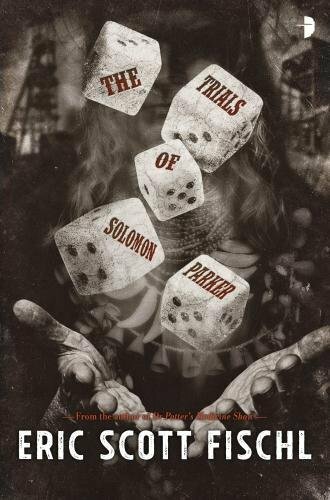 My latest book is “The Trials of Solomon Parker”, which is a loosely related follow-up to “Dr. 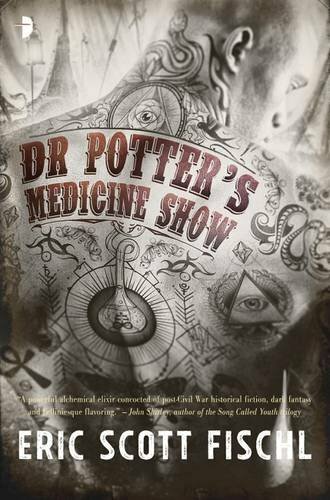 Potter’s Medicine Show” … which is much more horrifying: the story of a traveling medicine show in the 19th-century American West, hiding a dark, alchemical secret. The trailer for The Trials of Solomon Parker is here. The trailer for Dr. Potter's Medicine Show is here. I was a kid, reading Pet Sematary in bed late at night and my cat jumped on my chest, scaring the living shiznat out of me. The Shining, for all the Kubrick reasons. Also, a celesta will never not sound scary, because of using that Bartok percussion, strings, and celesta piece in the score. Dr. Potter’s Medicine Show, because I wrote it and that would be super. If only Kubrick was still alive. I mostly write historical spec-fic. Both Dr. Potter’s Medicine Show and The Trials of Solomon Parker can be described as dark fantasy. I don’t know that I even considered Dr. Potter to have such a strong horror element until people kept pointing out all the scary, twisted things in it. “Oh yeah, you’re right,” I said. I did everything incorrectly, and yet somehow in a very short period of time found a great agent and she quickly sold two of my books. So, it happens, but it takes a huge schwack of luck to go that route. I highly recommend doing things correctly, then, to better your odds: from social media engagement to events/meeting people to querying and everything else. They are fantastic people, with excellent taste in literature. Snappy dressers, morally exceptional, kind-hearted and lovers of life. Seriously, though, I’ve heard some really nice things from people I’ve met, both personally and digitally, and it makes me smile every time. They seem to run the gamut, the people I’ve heard from, so I don’t know how I would describe them, aside from the fact that they enjoy some dark, twisted stuff. I’ve seen some fan art, too, so at least some segment of that populace are very crafty & artistic people, as well. This is something that makes me ranty, the idea that any type of literature is inherently more or less legitimate than another. Examples of good and bad (or, more accurately, to any one taste or not) are found across the board, not just in genre, obviously. I think it’s maybe easy to snipe at horror because it’s a pretty accessible genre with a few tropes that some people complain are overused, not to mention its prevalence in other kinds of media: film, TV, etc, and that. Accessibility and well-worn tropes don’t automatically diqualify a genre from having some great stuff in it. I do, for the simple reason that, even given the rant above, genre fiction overall is gradually getting more respectable and not as ghetto-ized. More and more writers known primarily for serious literary fiction feel comfortable writing work that could be called genre, which I think helps open up genre to readers who wouldn’t have gone there originally; on the other side, more and more writers known primarily for genre work are getting notice for their literary quality. More readers willing to branch into genre equals more of a market, which means more writers willing to try different things to serve that market. I don’t really have hard data to back any of this up (aside from seeing the general excitement of things like Marlon James announcing a fantasy triology) and, of course, the publishing world is its own screwy mess about some things, but that’s the general sense I have, which I hope is correct. 1. Make good use of beta readers. 3. If there is any ONE RULE about writing, it’s that there’s no one rule. It’s mostly just figuring out what works for you, and what doesn’t. Keep at it. Also, don’t forget to revise. As an abstract concept divorced from human action, I’m not so sure. As the terrible things people do to each other and the world around them, absolutely. The mess we’re making of society and the world. Also spiders. And creepy children doing unnatural things. I LOVE HALLOWEEN. I live with a crafty person who makes epic costumes, props, and decorations, so we tend to Go Big.